Every good care plan starts with the evaluation or assessment. In the past, care plans for LTSS focused on managing symptoms, decreasing hospitalizations, and complying with recommended treatments. Less emphasis was put on the needs, hopes, goals, and preferences of the individual. Today, the Centers for Medicare & Medicaid Services (CMS) emphasizes person-centered care planning that promotes independence and quality of life. As a result, LTSS delivery has shifted towards individuals receiving services in their homes or community versus institutional-based settings. Services are delivered through state-specific HCBS waiver programs that provide beneficiaries and their caregivers assistance with skill development, respite, transportation, and other support services. State Medicaid agencies, and their partners, rely on functional assessment tools to make coverage and eligibility decisions and to create individualized care plans. 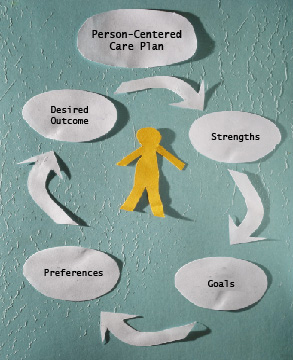 Assessment results are then used to create a person-centered care plan that recognizes individuals’ specific strengths and abilities, and identifies supports needed to achieve more independence. Person-Centered: Telligen’s experienced assessors understand the unique needs of the LTSS population, and the importance of employing a person-centered approach approach. This means that from assessment to service delivery, we’re helping individuals drive their own care – from picking their support teams, to indicating likes and dislikes about assessment approaches, to identifying the supports that will help them achieve their goals. Working as collaboratively as possible, we’re helping them carve out opportunities to live productive lives based on their strengths.This person-centered approach isn’t about the needs/goals of family members, providers, or support team. It’s about helping the individuals successfully achieve their defined goals, while remaining as independent as possible, no matter what their age. Conflict-Free: Telligen offers our state partners a conflict-free case management process free from conflicts of interest. Conflicts arise when interested parties performing assessments and/or developing the care plans opt for convenience and revenue over person-centered care. Our next article will go into more detail about avoiding and recognizing these conflicts of interest. Managing the varying benefits and eligibility requirements of Medicaid populations in Iowa, Oklahoma, Maryland, and Idaho. Conducting more than 35 training sessions (since 2014) for providers, beneficiaries, family members, case managers, and advocates.